From the Natural Pose sitting position, inhale slowly while standing and stretching your arms over your head. Your elbows should be slightly bent. Lift your face and stretch your chin up and back. Let your head, relaxed, follow your arms back, but let your neck hang back. Hold it up as Eugenia demonstrates in the above image. This is important to avoid injury, especially for beginners. Bend your knees slightly at the same time and keep your feet grounded. This position resembles a half-moon. Visualize the moon in the sky the way it is when you see it with this shape. That's a nice feeling to get while you do this stretch in the end of this series. Do whatever feels best with your eyes; they can be open, half open, or closed. Stretch your spine. Feel the stretch in your entire body. Exhale as you return to the first step you took when you started. Relaxed. Meditative. Focused. Balanced. More centered after this Moon Salutation series! This is the same as where you started, breathing normally. Stand straight with your feet hip-width apart. Place the palms of your hands together as shown in the image. Focus your attention on the positive and negative forces in your body and visualize that they are stable. 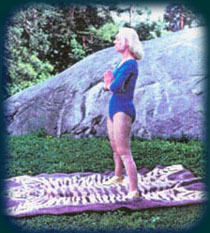 This is the end of Chandranamaskara, The Moon Salutation. Hopefully, after you have worked on these movements individually, you will be able to bring them all together into one flowing movement that doesn't take very long to do one complete series. It is a challenge, but the fun part for me is turning that challenge into a fun passion! Just remember, take it slow and easy. There is no reason to push the body into pain when practicing Yoga. And of course, remember the Moon while you do this. If you visualize the Moon the entire time, it will be easier to do this. If you haven't already read and learned the Moon Phases, please click on the link below —The 8 Phases of the Moon—to do that. The last 14 steps are one complete round of the entire Moon Salutation series. Try to do as many series as you can, comfortably. If you are doing the series many times, leave out Steps #1 and #2, and continue after Step #13 with Step #3 instead. If you want to repeat this series from 5 to 10 times, omit Steps 1 and 2. Start with Steps 13 and 14, then continue with Step 3. More details on Chandranamaskara: notes, tips, benefits, and how to change this series if it is to be done before you retire for the night.